Dragon Quest XI: Echoes of an Elusive Age is a massive game. 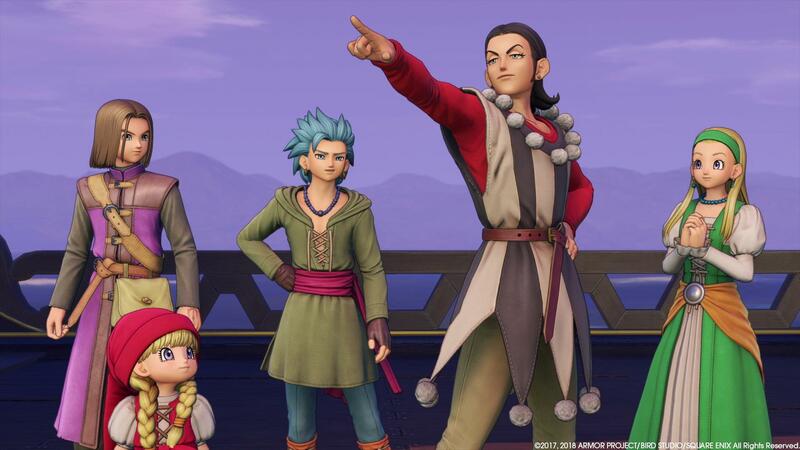 For an RPG it’s very accessible and not particularly challenging, but there are a number of tips we can provide to help put you on the right path, especially if this is your first Dragon Quest game. Whenever an ally joins you for the first time, the AI will automatically handle them in combat. The AI is fairly competent, and you can change how you want them to spend their skills via the Tactics option at the start of any fight. However if you want to actually control them directly, you’ll need to set them to Follow Orders. You only need to do this once, and we’d recommend leaving it on for the rest of the game. Dragon Quest 11 includes a convenient option to quickly top off your party HP in between battles. Simply open up the menu screen and hit Square (PS4) or X (XBO) to automatically apply healing magic and/or items to your party. It’s done in the most effective way possible, so you’ll never waste too much MP. Healing spells are generally cheap to cast, so keep everyone healthy! Something that can easily confuse everyone when they first stat playing is the ability to manually move around in battle – it actually doesn’t do anything. Combat is entirely turn-based and doesn’t take movement into account at all. You can set the battle camera for a more fixed and dynamic view that we found more enjoyable. It’s painfully easy to avoid battles in Dragon Quest 11. Enemies are clearly visible on the map and their sight radius and speed are quite low. But you’ll still want to fight at least some enemies to keep up your experience and levels. Enemies can also be a great source of loot, either as random drops or by stealing with Erik. It can also be very useful to fight at least one of each enemy in a zone. That way the enemy is added to your Defeated Monster List, which lets you see what items and materials they drop, in case you need to hunt it down later. The first ally you acquire, Erik, is a classic rogue. You’ll want to unlock the first ability in his Guile tree, Half-Inch, as soon as possible. That gives him the ability to steal items from enemies. It’s a frustratingly low chance, however. Equip him with items that boost his Deftness, which raises his chance to steal. Often you can steal useful crafting items from enemies. Assuming a battle is going well, try and steal as often as you can. Note that you can only ever steal one item per enemy. The Pep Power Itemized Kill gives you a guaranteed item from a single enemy. It’s worth doing every time you have the main character and Erik pepped up (the main character will need to learn Flame Slash, the first Sword skill, to unlock it). Check your Defeated Monster List for rare items that are worth going after. Dragon Quest 11’s crafting system is robust and rewarding. Crafting serves two purposes: crafting new equipment, and improving equipment. Often you can craft equipment better or equal to what’s available in stores using fairly easy-to-get materials (see above on not skipping fights). More importantly, crafting rewards Perfectionist Pearls, which you can use to Rework equipment. Every item can be improved up to +3, increasing its stats exponentially. Note that you can go from a +0 to a +3 in a single crafting session. In the beginning it’s difficult to hit the right spot but the more you craft the more abilities you unlock and the more Focus you acquire. Eventually you’ll be able to craft the best equipment and keep it updated with minimal effort. Keep practicing! Note that you can only craft at campsites, but you can Zoom to any previous campsite in the world. Everyone in Dragon Quest 11 has access to two or more weapon trees, but you’ll want to choose one and stick with it. This can be a tricky choice at first, but thankfully it’s incredibly easy to reset an entire skill tree’s worth of skill points at any save shrine or church, located in every town and campsite. It’s not a bad idea to start some characters on one weapon tree, then switch them over later. For example, it’s very handy to give Erik a boomerang at first. Boomerangs hit multiple enemies and will act as one of your only AOE attacks until you get Veronica. Later you can switch him over to Knives, where he can eventually dual wield and apply Poison and Sleep. Likewise Serena can wield a spear early on to help maximize your damage output. Later her melee attacks will fall off greatly compared to the others and you can comfortably switch her to Wands to boost her healing. Main Character: Swords. Though he’s the only one who can wield GreatSwords, Sword + Shield provides a solid boost to defense and good skills. Work your way to the top of tree to get GigaSlash, Falcon Slash, and Dual Wielding. Erik: Boomerangs initially, then Knives. As mentioned above, boomerangs are very handy as they hit everyone, but knives have much better abilities, and Erik can eventually dual wield them. Veronica: Heavy Wands. Veronica has the highest Magical Might of any character. She’s the traditional offensive mage powerhouse and Heavy Wands will boost her magic. She’ll have enough MP to cast spells constantly, but you can always bonk ’em with the staff to get some MP back. Serena: Spears first, then Wands. Serena’s melee attacks are decent when you first get her, and she can definitely help out in combat with a spear. Later switch her to Wands and keep her as your main healer. Sylvando: Whips. Sylvando has a lot of options when it comes to weapons, but I wanted a whip wielder. Sylvando is rather unique in that his weapon skills aren’t nearly as exciting as his unique trees of Litheness and Showmanship. You’ll get way more usage out of Hot Lick, Fuddle Dance, and Hustle Dance than any of his weapon skills. Jade: Spears have better abilities and more damage. Multithrust can do massive damage when she’s pepped up, with each hit capable of landing a crit. Note that she can still use both her Fisticuffs and Allure abilities regardless of her weapon type, and they often do a solid bit of damage. Rab: Heavy Wands. You could play around with Claws at first. Like Serena his melee attacks aren’t half bad when you get him. But by then you’ve got much better melee fighters, and Rab is primarily a spellcaster. [Spoiler]: Axes with a big ol’ shield. [spoiler] is the only character who can use Axes, and Axe abilities are crazy powerful, especially Parralax for single targets and Axes of Evil for multiple foes. Most of the Dragon Quest stats are self-explanatory, but Charm is a bit strange. Higher Charm leads to enemies occasionally losing a turn due to being enthralled with that hero. However, two of your allies use Charm for many of their abilities: Sylvando and Jade. Boosting Sylvando’s Charm stat increases the power of his Showmanship Tree, including the healing power of Hustle Dance. For Jade, Charm boosts her Allure tree. It’s not necessarily worth boosting Charm to the exclusion of Resilience or Attack Power, but if you have the option, give those two all your extra Charm boosting equipment. Dragon Quest fans know to salivate when seeing the rare and elusive metal slime. These enemies are found very rarely accompanying other foes, and you should prioritize them immediately. They’re very hard to hit, immune to spells, and tend to run away, but you only have to hit them a few times to defeat them. If you manage to kill one you’re rewarded with a massive amount of experience. Metal-specific abilities like Metalicker and Metal Slash can come in very handy, as well as any attack or weapon that hits multiple times. There’s one unique Pep Power you can use to farm metal slimes. If the Main Character, Sylvando, and Jade are all pepped up, you can unleash the combo Pep Power “Electro Light,” transforming all enemies into metal slimes! Your allies will enter a blue-hued Pepped up state upon dealing and/or taking a certain amount of damage. Their stats will be boosted for a number of turns, and they can also unleash powerful Pep Powers. Some of the most powerful moves involve Pep Powers with multiple heroes, but don’t unleash them too soon! Using a Pep Power drains your Pep, so it’s better to stay Pepped up for as long as possible and enjoy the stat boost. You’ll know when your Pep is close to running out when the blue halo around the hero’s portrait begins to blink. An interesting side effect to Pep is that it you can keep it for multiple battles. You can even switch party members out to store them in a Pepped up state for an upcoming boss fight. Use these tips to get started on your journey to the World Tree. Good luck, Luminary!